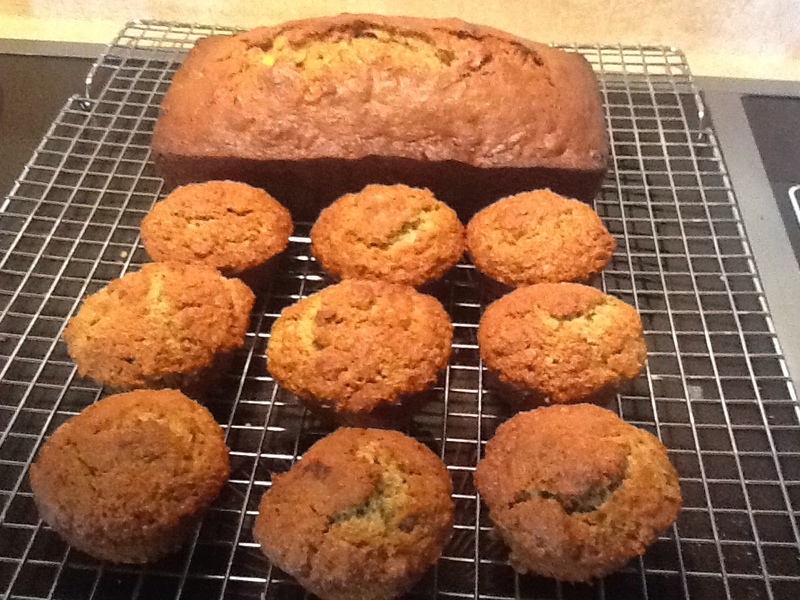 Over at Julie's: What to do with all those ripe Bananas. How many times have you bought a big bunch of bananas on sale and it seemed like they turned brown overnight? You have two choices, throw them out or try one of these yummy recipes! This first recipe comes from a beautiful cookbook Will gave me for Christmas over ten years ago. This is a quote from the book jacket, "If the United States had a book of treasured family "receipts," it would be this collection. Through more than three hundred heirloom recipes interwoven with lively narration, the Better Homes and Gardens Heritage of America Cookbook celebrates the country's regional cooking in all it's diversity. It also pays tribute to the determined "can-do" spirit of anonymous generations of people who through good times and bad managed to put forth splendid meals from what was at hand." "This fascinating saga begins three hundred years ago with the corn, bean, and squash culture of Native Americans in the Northwest and ends over a cup of caffe latte at a present-day Seattle coffee bar. In between is a taste of America that will make your mouth water." I have a least a hundred cookbooks, but this is my very favorite. It's a history book, picture book, geography book, regional cookbook and so much more! a prime source of this native wetland berry." In a mixing bowl combine flour, cinnamon, baking soda, salt and nutmeg. 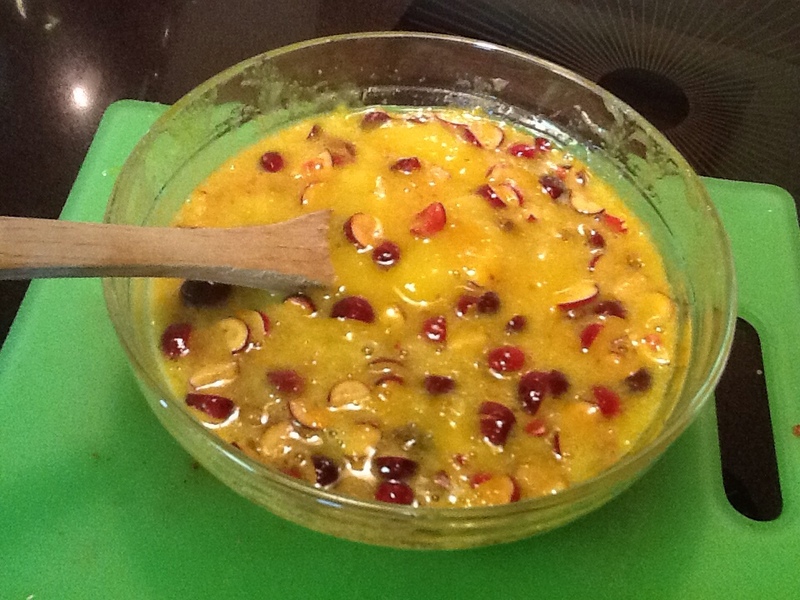 In another bowl stir together eggs, sugar, cranberries, banana, oil, and orange peel. Pour into a greased 9x5x3-inch loaf pan. Bake in a 350 degree oven for 50 to 60 minutes or until toothpick inserted near center comes out clean. Cool 10 minutes. Remove from pan; cool on a wire rack. Serve with Orange Butter. Makes 1 loaf (18 servings). In a small mixing bowl beat 1/2 cup butter with an electric mixer till softened. Liquid Ingredients for Cranberry-Banana Bread. 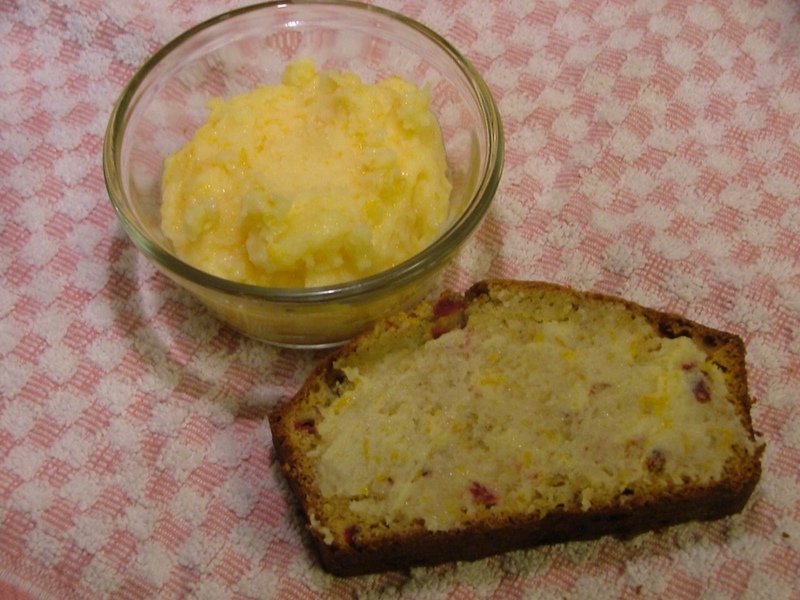 Orange Butter on a Moist Slice of Cranberry-Banana Orange Bread. This cookbook has 288 pages of everything you could possibly want to eat for breakfast! Makes 2 dozen muffins. Preheat oven to 375 degrees F.
2 cups cake flour (substitute: 1 3/4 cups flour and 1/4 cup cornstarch). 1 1/2 cups bran (I mix wheat and oat bran together). Optional: 1 cup chopped walnuts, 1 tablespoon grated orange zest. Preheat the oven to 375 degrees F. Grease the muffin pans. Put the butter in a mixing bowl and beat until creamy. Add the sugar and blend well. Stir in the banana purée and eggs, and beat until the batter is light and smooth. Sift the flour, bran, salt, and baking soda together (I sift onto a sheet of waxed paper). Add flour mixture to wet batter and mix well. Add any or all the optional ingredients. Spoon batter into muffin pans, almost filling them. (I use a muffin scoop for ease and uniformity). Bake 15 to 20 minutes. Serve warm. I made both of these recipes, one right after the other. My reasoning . . . the bananas were ripe; I already had my ingredients out; I could use the same mixing bowls and spoons and only have one wash and clean up! With 4 bananas available I cut the muffin recipe in half, ending up with 10 moist and crunchy muffins and a beautiful loaf of bread! So, the next time you're wondering what to do with those brown bananas, give these recipes a try or use my Banana Breakfast Cookie recipe found in the Recipe Index. Oh, by the way, Will and I had a little taste test and we both agree the Cranberry-Banana-Orange Bread with Orange Butter? A-Mazing! 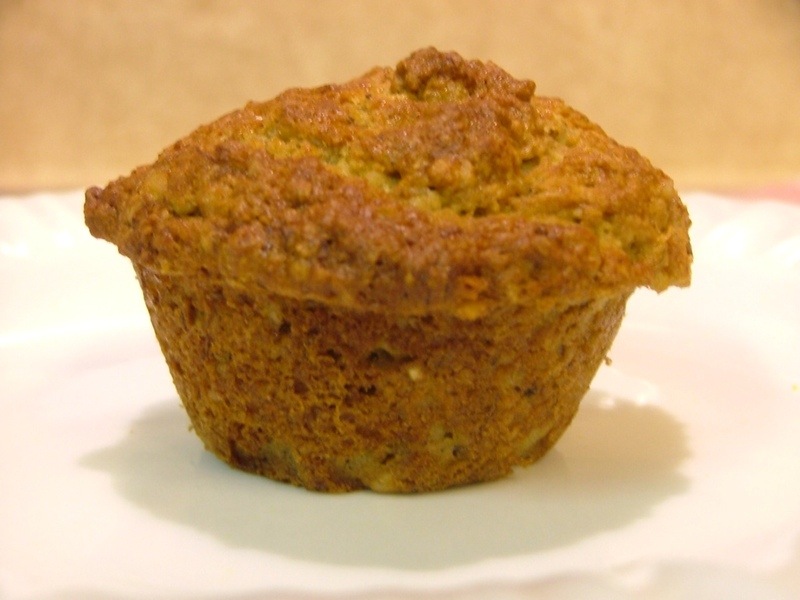 And the Banana Bran orange nut Muffins? Delightful! That's how it tasted . . . Over at Julie's!! !